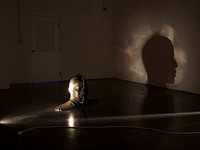 Sanford Biggers, a Los Angeles native who currently works in New York, creates artworks that integrate film/video, installation, sculpture, drawing, original music and performance. Using such disparate inspirations as hip-hop, Buddhism, politics, identity and art history, Biggers reveals new perspectives and associations from recognizable symbols. He allows the concept of a work to dictate his choice of materials, which have ranged from concrete and aluminum to beeswax. Biggers' has participated in prestigious residencies and fellowships, including: Akademie Schloss Solitude, Stuttgart, Germany; Ujazdowski Castle, Warsaw, Poland; Headlands Center for the Arts, Sausalito, California; ARCUS Project Foundation, Ibaraki, Japan; and the Art in General / Trafo Gallery Eastern European Exchange in Budapest, Hungary. His installations, videos and performances have appeared in venues worldwide including the Tate Britain and Tate Modern, London; the Whitney Museum and Studio Museum in Harlem, New York; and the Yerba Buena Center for the Arts, San Francisco. 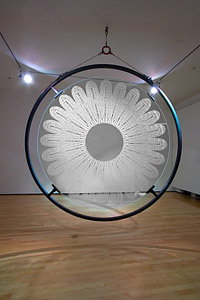 Biggers is Affiliate Faculty at the Virginia Commonwealth University Sculpture and Expanded Media program and was a visiting scholar at Harvard University's VES Department in 2009. He is presently Assistant Professor at Columbia University's Visual Arts program. The 2009 William H. Johnson Prize jury consisted of Rita Gonzalez, Assistant Curator, Contemporary Art, Los Angeles County Museum of Art; Rodney McMillian, Artist; Alison Saar, Artist; and Franklin Sirmans, Curator of Modern and Contemporary Art, The Menil Collection. approx. 12 x 18 x 15 ft.